How did I pass NCLEX on my first try with 75 questions? What was my specific study strategy for NCLEX while I was in nursing school? If you’re a nursing student or recent graduate, there’s no doubt that you’re probably stressed out over NCLEX. After all, you can’t begin practicing as a licensed nurse until you pass this exam. 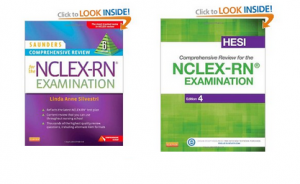 So, here’s how I prepared for the NCLEX exam and passed on my first try with 75 questions. I graduated nursing school on a Saturday (around the second week of May), and I started working as a new grad nurse that following Monday. I couldn’t yet perform do the full duties of an RN, of course, but I was orienting with the expectation that I would soon pass NCLEX and work as an RN. Because I went straight into a job working 36-40 hours per week, I didn’t have a lot of time to study for NCLEX, nor did I sign up for any NCLEX review programs. Therefore, I was glad that I started studying early. And that leads me to my first point: You don’t know what might happen after graduation, so it’s a good idea to start studying for NCLEX long before that time. In a sense, you’re always studying for NCLEX while you’re in nursing school, because you’re being prepared as you attend clinicals, practice HESI or ATI questions, take nursing school exams, and so forth. However, I officially started studying specifically for NCLEX during my winter break (on December 11th), just before entering my final spring semester. NOTE: I actually created a HESI and NCLEX study log that details the number of questions I practiced each day, so you might want to read that. A key part of my study strategy was purchasing comprehensive study guides. Because the nursing school I attended required students to pass a HESI Exit Exam, I purchased a comprehensive review guide for that (*affiliate ad link). In addition, I purchased (and highly recommend) the Comprehensive Review for the NCLEX-RN by Saunders (*affiliate ad link). Next, I took a comprehensive NCLEX practice exam using the software that came with the Saunder’s NCLEX Review book. These comprehensive practice tests are great because they will reveal your weakest areas. After learning my weakest areas for NCLEX, I printed out the results, created my study plan, and then I set out to study those specific diseases and body systems, making sure to start studying my weakest areas first. So, I started with my weakest area, and then I’d go and read about that disease or body system in the HESI study guide I used (if your school uses ATI or a different test, I’d recommend using that). Then, I’d compare what the HESI guide to what the Saunder’s NCLEX review guide said, paying special attention to things like nursing interventions, signs and symptoms, pharmacology, and so forth. However, the biggest thing I would focus on while studying was the pathophysiology behind each disease. Here’s why: It’s difficult to remember lists of medications, signs and symptoms, etc. But if you can form a deep understanding of the pathophysiology of each disease, you can think critically and usually find the correct answer, even if you forget some of the signs and symptoms, nursing interventions, etc. That’s why I always try to focus on the patho in my NCLEX review lectures. I want you to understand how the disease process works, because if you can understand that, everything else will click into place. After studying the diseases individually and comparing HESI and NCLEX review guides, I’d then use the Saunder’s software to practice tests specifically over those diseases or body systems. I’d select that I only wanted questions over, say, GI, and then I’d practice hundreds of those questions. Next, I read over my exam results, making sure to read the rationales (regardless of whether I got it right or wrong). In addition, the software would give a page number in the review guide for each question, and I’d go back and read and study the questions I had missed. As an aside, I never tried to memorize the answers to the NCLEX quiz questions. NCLEX doesn’t work that way. Instead, you have to understand the material, so that’s why it helps to read those rationales and then go back and review those weak areas or questions you got wrong. Another important part of practicing those NCLEX questions was making sure that I set the quiz software to display a different variety of question styles (select all that apply, hot spots, etc.). Your NCLEX exam will not consist of multiple choice questions alone, so it’s important to practice questions in all formats. During the entire nursing school semester, I’d repeat the process of focusing on individual weak areas. However, the week before NCLEX, I changed my study strategy. First, I requested a little time off the week before so that I could really focus on studying and have a fresh mind. Next, I practiced ONLY comprehensive practice tests for that entire week. In other words, I stopped working on my individual weaknesses and began to practice all areas by taking comprehensive practice tests with all possible question formats. The NCLEX itself is comprehensive, so once you’ve studied your weaknesses, I’d recommend switching back to comprehensive practice tests. For me, taking the NCLEX exam was a very stressful event. I knew there was a lot riding on it, and that increased my anxiety even more. I had so many people who were counting on me to pass: I had an employer who wanted me to pass so that I could practice within the full scope of an RN; I had family members who were hoping I’d pass, as well as friends and so on. One thing I do recommend to students is not to wait too long to take the exam. My reasoning is that you are really being prepared in nursing school, so if you wait 6 months, a year, or even two years, a lot of the material will begin to fade from your mind. That’s why nurses have to take continuing education courses and constantly refresh material, because the nursing profession is constantly changing. Another reason you don’t want to wait too long is that you risk becoming discouraged if you see that friends or others failed the NCLEX on their first try, and that can add to your anxiety or stress levels. When it comes time to take the actual NCLEX, you want to ensure that you have the right mindset. Don’t go into the NCLEX thinking that you’re only going to get 75 questions (for the NCLEX-RN) or 85 questions (for the NCLEX-PN). If you do that, it’s going to stress you out to the max if it doesn’t shut off at those numbers, and you’re going to think that you’ve failed. I prepared in my mind that I was going to have to take the full number of questions, so I was relieved when it shut off at 75 questions. I’ve heard from several nurses that they stressed themselves out because they thought they’d already failed when the test didn’t shut off at 75 questions, and they just started selecting random questions, which caused them to fail the test. Instead, go into NCLEX expecting that you’ll get the maximum number of questions. Finally, when you are answering those NCLEX questions, try not to overanalyze the nature of the questions. Some people think to themselves, “Well, I’m getting a lot of easy questions, so I must not be doing well on this exam!” That’s not necessarily true. Just keep plugging away and answering each question to the best of your ability. What if You Fail NCLEX? What if you take the NCLEX and fail your first time around (or even the second, third, or fourth time)? It’s probably going to devastate you. You’ll probably begin wondering if you’re really cut out for nursing. You’ll probably cry or feel deep despair. And it’s going to be painful and embarrassing having to tell others that you failed. However, you have to pick yourself back up. When I was hired on as a new nurse graduate, my preceptor was an amazing nurse. She was super hard-working, and she knew her nursing knowledge forwards and backwards. Patients, coworkers, and physicians absolutely loved her. But my point is that it just goes to show you that some of the best nurses in the world failed the NCLEX exam. This test doesn’t predict how well you’ll perform as a nurse. It’s just a test you have to pass in order to become licensed by your state. And there are a lot of reasons why people fail. People have difficulty understanding the questions, and some can be tricky or worded in an awkward way. Sometimes people become stressed out and psych themselves out during exams, or they overanalyze questions. Or maybe you just had a bad test day. If you do fail NCLEX, it’s normal to feel distressed or angry, but you’ve got to pick yourself back up. Remember this: You just made it through one of the most difficult undergraduate programs out there, which is a huge accomplishment. If you can get through that, you can pass the NCLEX exam! You have what it takes to become a nurse! So pick yourself back up, dust yourself off, and reschedule another NCLEX exam date. You’ve come this far, so don’t give up now. Quitters never win, and winners never quit. You have what it takes to become a nurse, and you will become a licensed nurse, regardless of how many attempts it takes you to pass! Go and do it!